It was a Friday evening, two weeks after we lost our precious boy, when the phone rang. I had been letting my husband answer the phone for weeks. I couldn't bare talking to anyone. But he was out for a few hours, so I answered. It was the funeral home, calling to tell us that Nicholas' (ashes) were ready to be picked up. "We are opened until this time and then again during these times tomorrow" the woman said. It felt like I was making arrangements to pick up my dry cleaning. My heart stopped, I'm not sure I said anything at all and then I hung up. Wow, thanks for that..... and then I was anxious to have my son home, with his family. I called my husband, knowing he would be on his way home, and told him the news. He called me a few minutes later and asked me to meet him in the driveway. It was snowing, cold... figid, actually. I could barely breathe when he took my hand and laid it on the green velour bag that held our son. My husband wanted us to walk him into our home together. He was finally home, where he belonged. I remember feeling utter desperation, complete despair.. but I also remember feeling a sense of relief. It had been a very long two weeks living with the knowledge that Nicholas was not yet at peace... I was grateful that he was now with us. 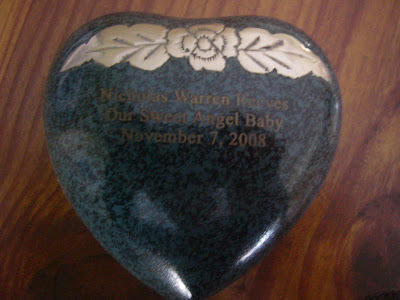 Earlier that week the funeral home had called to say that Nicholas had arrived from the hospital and that we could bring anything over that we wanted him cremated with. First, we stopped by my parents. My mom had bought Nicholas an outfit and wrote him a note and a dear, dear friend had made him a crocheted afghan. As soon as I saw my parents, I dissolved. No words were spoken. Just hugs and tears. My dad announced that he was going to come with us, as much for himself (I suspect) as for support for us. I remember barely being able to get out of the car.... walking, hand in hand with my husband, to the front door and stepping inside this place I never, ever imagined having to be for my son. We "spoke" with the lady there for a few minutes and left my dad in the lobby. When we came out, dad was nowhere... maybe he was outside waiting... and then it hit me. The doors to the chapel were closed (they were opened when we arrived) and I just knew that he was in there with his grandson. Meeting him, holding him, caressing him, loving him. My husband and I had talked about whether we were going to take the opportunity to see Nicholas again. We had decided against it for the simple fact that we had already said goodbye. I wanted to remember his beautiful, fairly warm, pink skinned body..... But, let me tell you, as soon as I realized that my baby boy was just behind those doors there was NOTHING stopping me from seeing him again. I literally felt an electric pull....the deep, unstoppable connection that a mommy feels for her babies. I made sure that it was okay with my husband (as I am still mindful of his feelings) and he assured me that he would support me in whatever I needed to do. We walked through those doors and there he was, in a little white box, covered in a blue blanket, looking totally peaceful. I remember falling to my knees, completely overcome with grief... so weak and powerless. I touched him, I kissed him, I cried and cried and cried and cried for him. BUT, I am so grateful for that experience. I am grateful I was able to physically see my baby boy one last time, with my pillars of strength, my husband and my Dad by my side. I never saw Hope again after we left the hospital. Sometimes I wish I did take one last look at the funeral, but then I worry I might have taken her little body and ran off in to the sunset with it, never to return. Thank you for sharing Nicholas' story. Sending you much love as you write these tough experiences. Oh gosh I am in tears as I read this. It brings back memories from our short three months ago. We did not have our sons cremated but we had a memorial service for them and the funeral directors asked us if we wanted to see them again. I couldn't. I wanted to remember them from when I gave birth to them. Warm and alive. Thank you for sharing this story and the beautiful picture. I could see myself standing there and crying with you. Thank you for sharing such a touching memory. I hope through retelling it helps you to heal. I truly respect and appreciate your honest writing. PS in agreement with the others, you have a wonderful husband! Thank you for sharing this delicately beautiful and heart breaking chapter with us all Lea. It felt like I was standing right there with you. Sigh. More sighs than I should be allowed to have. Thank you for sharing this piece of Nicholas's story. My heart is heavy thinking about it. This was a terrible step in the journey for me, bringing my daughter home in a box. I wish I had thought to ask to see her again, whether at the hospital or at the funeral home. i really had no idea where she was, and I was in such a state of sock that I didn't even think of it. We had Baker's body brought back to my hospital room so that his grandparents could see him and kiss him. It ripped my heart to shreds to see him so cold and stiff. I prefer to remember the warm, soft baby I held in my arms, but I'm glad that they got to meet him. Many tears for you and your sweet one. Wow I have tears just streaming down my face, the courage you had to see your little boy again . You will cherish those moments forever. Anonymous ~ thank you for visiting and taking the time to read Nicholas' story. I am so truly sorry for your loss.... I'm glad you go looking for "friends", support... we need all the help we can get. Love and strength to you on your continued journey.